Synnefo is a complete open source IaaS cloud stack written in Python that provides Compute, Network, Image, Volume and Object Storage services, similar to the ones offered by AWS. 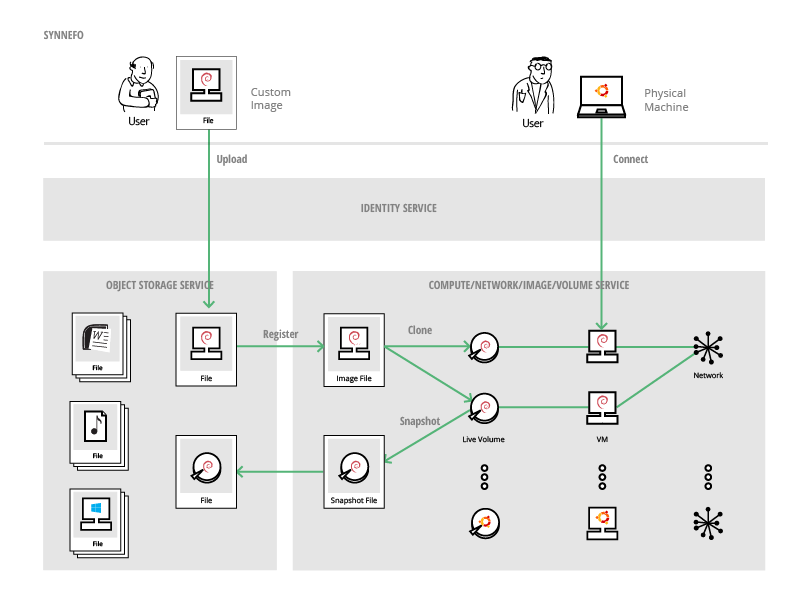 Synnefo manages multiple Ganeti clusters at the backend for handling of low-level VM operations and uses Archipelago to unify cloud storage. 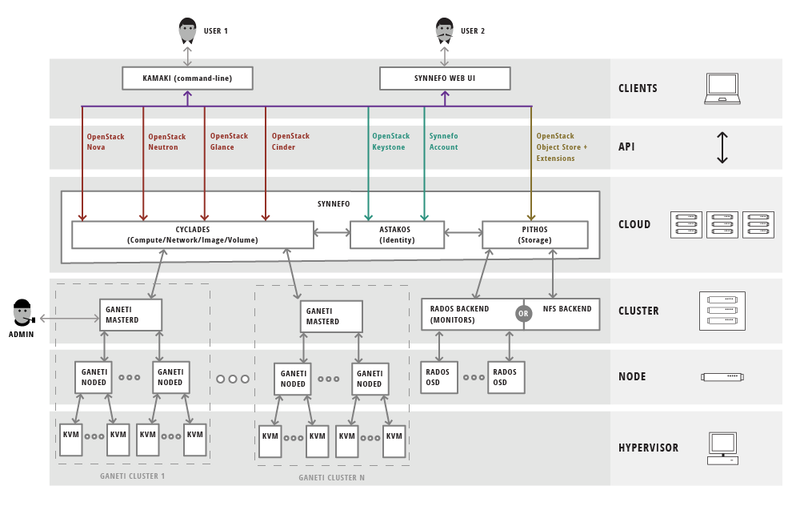 To boost 3rd-party compatibility, Synnefo exposes the OpenStack APIs to users. Synnefo came out of GRNET’s ~okeanos public cloud service and you can try it out live at demo.synnefo.org. It unifies storage resources (Objects/Volumes/Images/Snapshots) using Archipelago as the common storage substrate for all services. Synnefo is designed with simplicity, scalability and stability in mind. Although it can be deployed in small configurations, it was initially designed to address large-scale installation problems. Synnefo manages multiple Ganeti clusters and different storage backends (e.g., Ceph/RADOS or NFS-based backends as shown in the figure). For an extensive view of all components, the interconnection and APIs between them, please take a look at the Admin Guide’s corresponding figure. The Quick Installation guide describes how to install Synnefo on a single node in less than 10 minutes using the snf-deploy tool. This kind of installation is targeted for testing and demo environments rather than production usage deployments. It is the perfect way, even for an inexperienced user to have the whole Synnefo stack up and running and allows for a quick preview of the basic Synnefo features. This installation method is only available for Debian Wheezy.